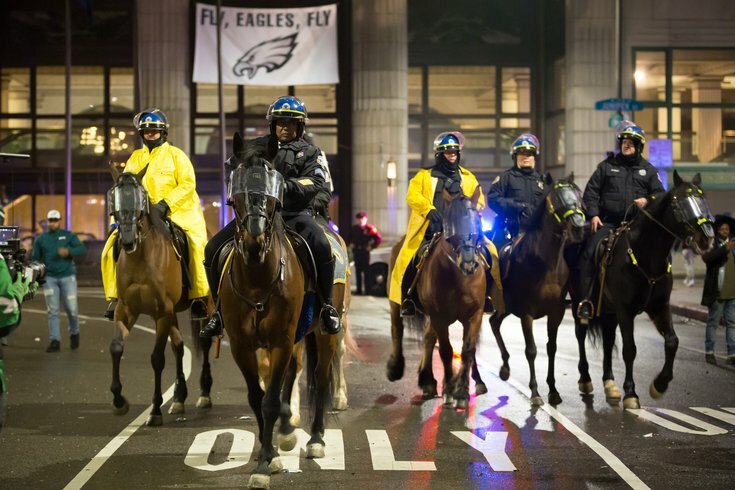 Mounted officers of the Philadelphia Police Department ride horses toward the crowd on South Broad Street during celebrations following the Philadelphia Eagles' win in Super Bowl LII on Sunday night. Hey man, I was pretty stoked after the Eagles vanquished the mighty New England Patriots on Sunday night to win the Super Bowl, and I did my fair share of celebrating along with everyone else on Broad Street. But I guess I wasn't this excited. A video making the rounds on the internet shows an Eagles fan during the city-wide afterparty literally eating horse poop. You can watch said video below, but be warned, it's disgusting — mainly because it shows a human being eating actual animal feces. I mean, at least he didn't punch a horse.